My hair grows fast and I've sported many different styles, but one thing is consistent throughout: It's hard to keep my hair out of my face and I sweat a lot. If you're fortunate enough to run, cross train or do anything active without a lot of sweat, I'd love to know your secret. My least favorite consequence currently from cutting my hair short is I have plenty of sweat dripping down my face. In an attempt to minimize primping time and maintenance to go for a run, I seem to have created a fast flowing river of salt directly into my eyes. Ouch. I had not heard of Ponya Bands and thought it well worth the try. These bands are different than the popular headband piece attached to elastic for the part that fits in the back of your head. These bands are made of a stretchy material that create the entire band. Others have claimed to be "no slip" but I must have an odd shaped head, because those claims just couldn't hold up for me and the other bands end up shooting off the back of my head like an over stretched rubber band if I don't keep yanking on it. Not Ponya Bands! Simply stated, Ponya Bands stay put. I tried both the Sweatband and the Headband with complete success. 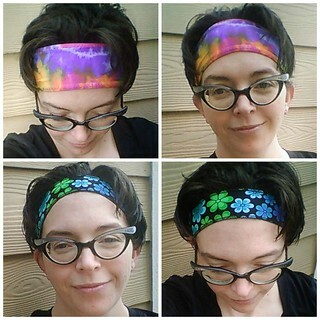 My sweatband is 3 inches in width and lined with a soft microfiber bamboo fabric under the bright “Tie Dye Pink Multi” pattern and my “Jasmine” floral print headband is 2 inches and lined with a luxurious crushed velvet. Both lining help the band to stay in place, while the specific material has some cool properties as well. Bamboo (which is used in the sweatband) is very absorbent and helps wick moisture away from the skin, which has completely helped that stream of sweat flowing down my face. The crushed velvet in the headband not only feels nice, but helps lock the headband in place and keep those fly away hairs from getting in the way. Other bands have a history of irritating pressure points, squeezing my head or just giving me a plain ‘ol headache after wearing the headband for an extended amount of time. 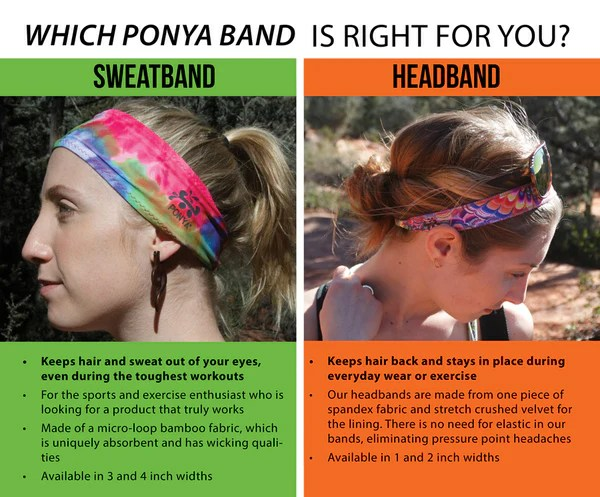 Ponya Band has completely avoided this because of the design by making the bands entirely out of one stretchy material. Check out their webpage linked above for the fun, bright, or gender neutral designs and give them a try! Also, keep and eye on their faceboook page for upcoming deals and promotions. Robin grew up as a couch potato and did everything she could to get out of exercise, until one day a good friend would not stop talking about this fun 5k race she was doing. Finally Robin got off the couch and trained for this "fun" race using C25K (couch to 5k program). After crossing that first finish line, she kept going and became a "runner". After losing 80 lbs, gaining health, a love of being active and setting a healthy example for her husband and kids, she thinks she'll stick with this whole "running thing".